Life doesn’t work as a series of binary outcomes, so why should your website analytics? We’re forever recalling the times that we ‘nearly’ did something, or ‘almost’ did something else, and understanding those moments can really help you get to grips with how people engage with your website. In this blog, we’ll be discussing how you can use Google Tag Manager to track the interactions which make a difference to your business, as well as the ‘nearly’ and ‘almost’ moments that allow you to improve your marketing strategy and website design. When speaking to clients or delivering training on using Google Analytics, I challenge people to find these micro and macro moments that mean something to their business. A website with a 5% conversion rate is left with a 95% majority of users who seem to have offered little value other than contributing to your pageview count, and that’s where micro goals come in! Another advantage of using events is that they can carry four individual values (category, action, label and monetary value), rather than simply ‘yes’ or ‘no’. This allows you to combine multiple contact form events into a single goal, or focus a report on the visibility of a certain section of a landing page. Excited? Here are some practical examples of how you can apply these yourself, using a combination of Google Tag Manager and Google Analytics. Variables and Tags and Triggers, oh my! A lot of the tips included below assume some knowledge of how Google Tag Manager works. We thoroughly recommend Google Tag Manager for all websites, as it can provide both a boost to your website’s speed, and give you access to a vast level of tracking without too much modification of your own site. 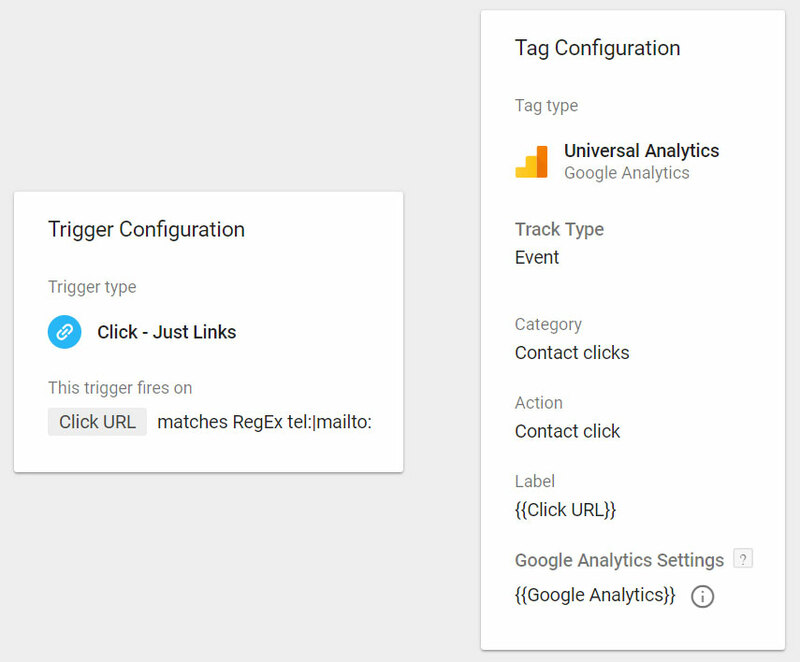 In brief, Google Tag Manager is able to ‘listen’ to every piece of code on your website, and be trained to perform certain actions in given situations. In most examples, we use triggers to define a situation or event to track, tags to actually do something when a condition is met, and set variables to pass information about what has happened from your website to Google Analytics. Google Tag Manager manages to listen for all of these things using a data layer connected to both your website and your published container. A data layer is a central source for all the information that needs to be passed to and from Tag Manager, meaning it can be programmed to filter, amend and send data to various tools. Although it has a relatively steep learning curve, Google Tag Manager is simple to use once you’ve invested a little time getting to know it. Google’s help guide is a great place to get started, and there’s even an online exam to make sure you’re totally up to speed. Starting with the bread and butter of any lead generation website, we’ll look at how this approach can improve the data gained from contact forms on your site. Traditionally, contact forms have been tracked by using a ‘thank you’ page, by simply asking Google Analytics to count the number of pageviews to a specific set of URLs. We often see wildly exaggerated goal completion numbers from this method, as simply refreshing this page will increase your conversion rate and skew your reports. There are multiple ways to track contact forms with events, but the simplest one by far involves the use of Google Tag Manager. This system has a pre-built variable set for identifying form completions, with the option to even add additional validation to check whether a form has been successfully submitted. If your site has multiple contact forms, or if you’re interested in collecting data on newsletter signups or callback forms, these can all be identified using unique labels. Using the micro/macro method here allows you to track valuable data about every form completion using events, but decide which of them contribute towards your conversion rate. One of the biggest struggles for many businesses is how to measure the true effectiveness of placing your phone number at the top of your site. While there are various companies offering trackable phone numbers, these can seem like a huge investment for smaller businesses. With the rise of mobile, there’s never been a better time to implement tel: and mailto: links, and of course, track their usage. 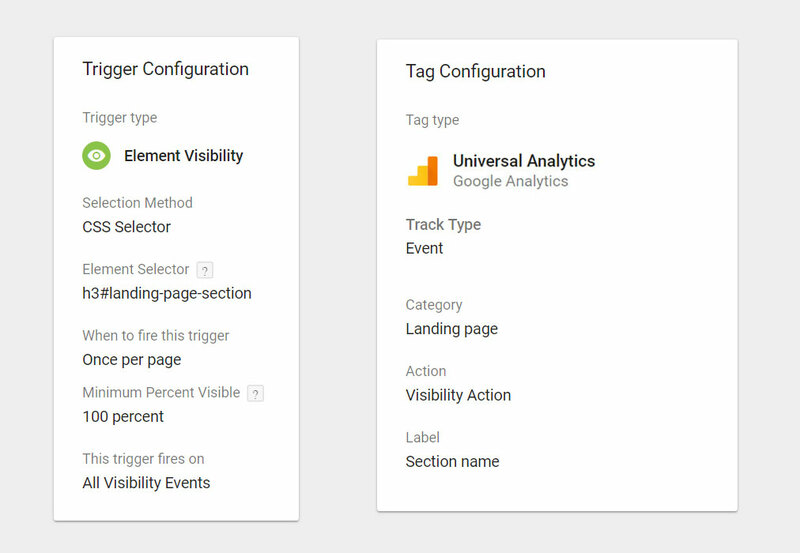 Using Google Tag Manager, it’s easy to track the clicks of these elements and send them to Google Analytics as events. For this, you’ll need to enable the in-built ‘click URL’ variable, and set up a trigger to measure any link clicks containing either tel: or mailto:. If you have multiple branches or offices, you can further define this trigger to only fire on specific pages, or even create a lookup table which contains definitions for every number or email address on the site. Again, it’s completely up to you what you class as a big or small win for the website here. It’s a good idea to invest time in a lookup table for large-scale volumes of numbers or emails and gives you a good opportunity to rename them to something that’ll look easier on the eye in your reports. We all like to show off how social we are, with most businesses opting to add social media links to either the header or footer of their sites. Often new customers will check out your Facebook page or recent tweets looking for legitimacy, so it’s important to know how much traffic your site is sending to these channels. These can be measured using the ‘click URL’ variable again, and a trigger set to look for the URLs associated with your various social media profiles. Again, you might want to restrict this to specific pages for multiple brands or create more specific triggers for links to different posts on your social media channels. Again, it’s totally up to you how much of this data you track, and whether you consider it a micro or macro interaction. Identifying how many customers visit your social media profiles and return to your site afterwards can give you an excellent view of how much these channels are used to build trust with potential customers. Videos are a great alternative to written content or images and give you a fantastic alternative to convey your message. Whilst there are some analytics data available within YouTube’s dashboard, it’s hard to get a clear picture of exactly how many visitors have watched (especially combined with what else they’ve been doing on your site). 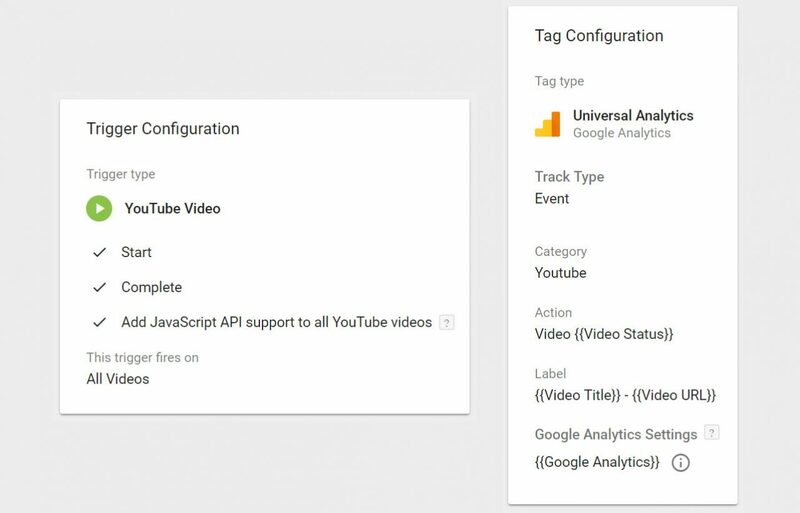 Luckily, Google Tag Manager has a built-in set of YouTube variables, making it simple to add this to your reporting toolkit. Simply choose ‘YouTube Video’ as your trigger type, and tick the elements you’d like to track. The tag then makes use of these variables to output dynamic events based on what’s been viewed, and where. Adding additional variables within the trigger will allow you to measure when a visitor has viewed a certain percentage of a video (great for long how-tos and guides), and even how many times the video is paused and how much time is spent buffering. It’s worth noting that this tracking is only supported by the latest YouTube embed methods, so check you’re using the most recent one before attempting this. If you have an ecommerce website, or even if you just sell a few items on your site, it’s useful to know which are your most popular products. While it’s true that product pageviews are a good measure of exposure, using Enhanced Ecommerce tracking provides a whole lot more data. From where your products appear in category listings to how many times they’re added and removed from a shopping basket, this really is the micro goal reporting every ecommerce site needs. It’s even possible to track refunds using this method, which means your Google Analytics data will be much more accurate when it comes to those end-of-month reports. As Enhanced Ecommerce requires your website to send information directly to the data layer, it’s normally necessary to modify your website template or manually tag pages. For this reason, we normally suggest the use of a plugin for your chosen CMS, or failing that, speaking to an experienced developer. Once enabled, you simply need to check the ‘Enable Enhanced Ecommerce Reporting’ toggle within Ecommerce settings in Google Analytics. If you’ve used a plugin and/or your developer has done everything correctly, you’ll see a new range of reports appear under the Conversions > Ecommerce header, containing all the new information provided. Our final category is arguably the most expansive, as it allows you to track any element on your website based on whether it has appeared on a visitor’s screen or not. As the options here are practically unlimited, this method is best used for popular landing pages, or pages containing a lot of information. Google Tag Manager has been kind enough to add a predefined trigger for this in recent months, making it far easier to define the element you want to track. By far the easiest way to configure this trigger is by using CSS Selectors to define the precise element you’re interested in. If you want to make sure someone has actually taken an interest in the element you’re tracking, you can also define the length of time (in milliseconds) it needs to be on a users screen before it is tracked. Not happy with the near-endless possibilities for element tracking? You can combine these triggers with various RegEx and lookup tables to create really useful dynamic events for sets of landing pages, website banners, or anything else you might want to track! It’s never been easier to set up additional, detailed tracking on your website thanks to amazing tools such as Google Tag Manager. Adding in a number of micro goals to your site gives you a much wider picture of what’s really going on, and will ultimately lead to you make better decisions. Our suggestion is to come up with a detailed tracking plan before implementing any of the above, which makes it far easier to manage your data and set targets. Once you’re happy that your data is coming through as intended, using something like Dashthis to create automated reports makes it easier for all to digest. Remember, think about everything that makes a difference to your business. Enquiries and sales might be the end result we’re all striving for, but identifying and tracking a range of micro goals is an essential step in improving your site and increasing your macro goal conversion rate.